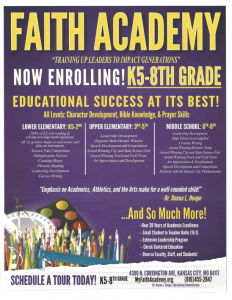 Faith Academy proudly utilizes the Bob Jones and A Beka Curriculum. The Bob Jones Curriculum: Provides Christian Schools with outstanding curriculum and textbooks that encourages Christian character and promotes critical thinking and academic excellence. The A Beka Curriculum: Excellence in Education from a Christian Perspective, provides Christian Schools with outstanding curriculum and textbooks built on a foundation of academic excellence and Christian character. When children have solid Christian values they feel loved, accepted and secure. When these values are in place, they make responsible choices and feel approved by their family, friends, and community. As they mature into adulthood, strong values encourage children to choose right from wrong as it applies to God’s word. When they realize that the principles and promises of God are true, it is then that they are able to share the “Good News” with those they meet. We call that Evangelism! As the Word of God is taught daily at Faith Academy, each child becomes equipped to live a victorious life, prepared to be an example to all they encounter. The “Right Choice Club”, “Chosen” and The Junior Pearl Society encourage boys and girls to make godly decisions, establish personal convictions and to have compassion for others. Quarterly outreaches provide avenues for students to demonstrate God’s love. The emphasis in Leadership Development trains students to identify their strengths and weaknesses in academic performance. Students who excel in their academics enter into the Ambassador Program. This program emphasizes the importance of recognizing and challenging those students who have proven to accurately and swiftly grasp concepts and subjects. Students who need academic assistance to improve performance on state exams, standardized testing and weekly testing enter into the Discovery Program. The emphasis here is to offer remediation and to close the gaps in learning through one-on-one flooding and loading exercises. This insures students’ success in the classroom setting. The Discovery Program is supervised by a Resource Teacher. Emphasis is placed on Early Childhood Education development from Nursery (6 weeks) through four year olds. Academic emphasis is placed on developing fine and gross motor skills. Based on Christian principles, a child’s primary foundational beliefs are introduced at this level. Reading readiness activities, phonics, numbers, and math concepts are introduced through the A Beka and Pinnacle Curricula. Language development is nurtured during expressive story time, circle time and letter recognition. Gross motor skills are fostered through floor exercises, learning centers, small groups and one-on-one activities. Finally, fine motor skills are developed through building blocks, puzzles, coloring, and free play. Communication is a necessity to compete, succeed, and achieve in the educational arena. Students must be able to articulate their thoughts, debate a topic, dictate conceptual information and express their beliefs in a formal manner. Reading comprehension, written and oral communication, and distinguishing relationships between formal and informal language will be taught. Students will be prepared to compete at all levels in local and District wide competitions. Public speaking, prayers, reciting poetry, and choral reading will be stressed from Nursery throughout the eighth grade. The music and fine arts program places emphasis on fostering a love for the arts through exposure and instruction in the arts. Beginning in the preschool, students are introduced to the arts weekly. The Elementary students (K5-2nd grades) receive instrumental lessons and are introduced to concert band by formulating a percussion and recorder ensemble. The third grade students throughout the eighth grade perform in Choir, Band, and ensembles on site, during weekly services, chapel, banquets, and ministry outreaches. Annually, students compete locally in academic competitions throughout Kansas City’s private, parochial and public schools. Science and Technology are rapidly changing the world today. We are a global society and therefore the students of Faith Academy are preparing to compete with their peers around the world. Our students will investigate and conduct experimental concepts weekly through demonstrations, research and presentations. Instructions will encompass the use of technology, interdisciplinary projects, and both independent and small group work. Students will compete in both District competitions and in the Kansas City area. Students will have opportunities to compete nationally. Weekly reparation is done to prepare students for these competitions. Critical thinking and applying creativity in their projects are highly stressed throughout this module. Faith Academy, home of the Lions, has brought numerous championship trophies and banners in basketball and track back to our state of the art Activity Center. The Athletic Program emphasizes the importance of a positive attitude necessary not only in athletics but also in academics. Students are encouraged to discover their athletic potential while they are challenged to strengthen their weak areas. Teamwork is a must for every participant. Fitness and personal training are offered twice a week to each division by a trained and licensed professional. Health and wellness are weekly parts of the curriculum as students are trained to eat healthy.